Chasing your tail and still not getting everything done? “We are what we repeatedly do. Excellence, then, is not an act, but a habit.” It’s a quote that sounds as if it could have come from any contemporary management book. In fact, it’s one of Aristotle’s pithy aphorisms from well over 2,000 years ago. Good habits are worth developing because they are grounding and provide order and structure. However, making and maintaining them in a world that’s “on” 24/7 and obsessed with change and novelty is no small challenge. Most people simply have too much to deal with from reading tweets, posts and emails to processing the sheer volume of information constantly coming at them from multiple sources. Maintaining good hygiene habits in the face of such perpetual motion can be an uphill battle. One common coping mechanism is the “to do” list. It is tried, tested and effective if used well, but it can actually be counter-productive if it’s too long. Short is better because the key is to prioritise. If your list has 10 items, reduce it to the five that will deliver the biggest return on your effort and focus on them. In the early 1900s, the Italian economist Vilfredo Pareto put forward the theory that 80 per cent of effects come from 20 per cent of causes. What has become known as the Pareto Principle has since been widely adopted in business. A classic example of it in action is that 20 per cent of a company’s customers typically account for 80 per cent of its sales. On a personal level, it means that 20 per cent of what you do in a day will be responsible for 80 per cent of your results. That’s why de-cluttering your to do list is way more important than adding to it. 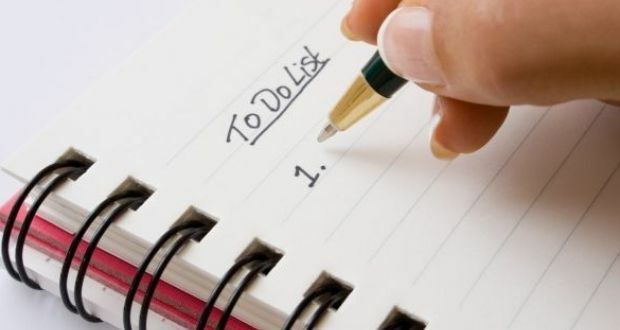 In fact, there is a growing trend towards the “not to do list” where you take conventions such as the mandatory early Monday morning meeting and bin it because the reality is that these meetings are rarely productive as people are not at their best. Other good habits worth cultivating include not travelling unless you really have to, not allowing meetings to run on, banning digression from agendas and not allowing other people’s inefficiency or tardiness to derail your objectives. In short, manage your environment. Don’t let it manage you. Canadian entrepreneur and founder of MetaLab Andrew Wilkinson calls not to do lists “anti-goals”. What led him to the concept was “living to the relentless beat of our calendars and feeling stretched. We were doing business with people we didn’t like and doing everything on a schedule that was dictated by other people’s needs”. Wilkinson’s anti-goals include never having a face-to-face meeting when you can do it another way and never scheduling morning meetings – he believes in sleeping on. “Of course, we still have the odd unavoidable crappy day, but these simple anti-goals have made our lives immeasurably better by setting an anti-goal instead of a goal. Try it sometime. It’s insanely simple and strangely powerful,” he says. Real productivity is not about ticking boxes. It’s about getting the things that matter most done. For some, this may mean breaking out of old habits such as being too accommodating or perpetually multi-tasking with the result that nothing gets finished properly or on time. Stephen Covey, author of what has become a classic tome of personal change, The 7 Habits of Highly Effective People, says that habits are powerful factors that express our characters and dictate our effectiveness or ineffectiveness. He concedes that breaking a habit is tough but “once we break out of the gravity pull, our freedom takes on a whole new dimension ... we can use the gravity pull of habit to create the cohesiveness and order necessary to establish effectiveness in our lives”. When feeling overwhelmed, it is easy to let positive habits slide. An example is the short break. Even 15 minutes away from your desk gives your brain time to change gear and to feel refreshed and more productive. Ideally, that break should be spent quietly to calm the mental chatter rather than getting involved in a work-related conversation with a colleague. If you have the flexibility, take a 20-minute power nap. It has been shown to greatly improve efficiency for the three to four hours that follow. Where possible develop the habit of saving the most demanding tasks for when your acuity is sharpest. For some, this will be in the morning, for others later in the day. If you can, organise part or all of your day around your body clock and ditch the conventional practice of starting days by checking emails, calendars and having meetings. Speaking of emails, they are one of the biggest drains on productivity. Try to reduce the number of times a day you check them as they invariably distract from the task in hand. Also cut the volume of mails you receive by asking employees/colleagues not to cc you on every mail they send. Most of the time they are doing it to cover their backs or as a means of shifting responsibility. Tell them the time has come to break this bad habit.